I guess it’s partly to do with being impromptu too. So when countryman Pierre took the lead with his GPS routed the long way back, his grin widening, little did we know. It just got better. Better and better. The curves, the dips, the scenery, the empty tarmac. Slowly crunching up the hotel driveway, high-fives and jubilation all round. As Terry cried: never have my handlebars been that close to the tarmac time after time. 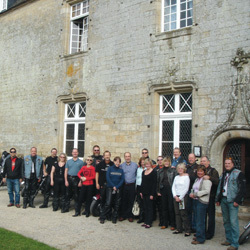 This year we had filled the manoir, many WAGS had flown in too. That night we rejoiced and celebrated with mountains of crustacea and mollusc washed down with fine wines. The annual Lobster Run is here to stay.